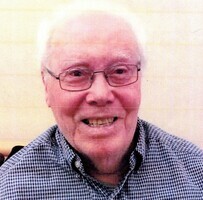 Provide comfort for the family of Herbert Biggs with a meaningful gesture of sympathy. Herb was a true family man who dedicated his long life to his darling Betty, and his 3 daughters - Sue (Dale), Kate (Ian) and Mary. His lifelong lesson to us was always “to shoot for the stars”. Dad was passionate about the simple joys of life - nature, his beloved cottage on Grace Lake, books, music, dogs and babies. He was wise yet modest, with a keen mind and photographic memory yet had a wonderful sense of playfulness along with a zany sense of humour. Life was a precious commodity to Dad. He had a huge heart and was always there to help anyone in need. A family friend called him “an unsung hero”. Dad was a Flight Lieutenant (Navigator) with the RCAF 405 squadron, Pathfinders. He was a humble recipient of the Distinguished Flying Cross (DFC) at the end of WWII. Following the war, he had a successful career with the Toronto Dominion Bank in Toronto. We are indebted to Karen, Amanda and the entire team at Fairview Manor for their compassionate care, dedication and kindness to Dad and to his family. Poppa lives on in the hearts of his all who knew him, especially his grandchildren and great grandchildren. Thanks for making the world a safe and better place for us all to grow up in. Shoot for the stars Dad! Next spring our family will honour Dad’s memory in a private service. Donations in Herb’s memory may be made to the Hub Hospice or the Lanark Animal Welfare Society (LAWS). Provide comfort for the family of Herbert Darrell Biggs by sending flowers. In loving memory of Herb Biggs. Sending our love to you all.